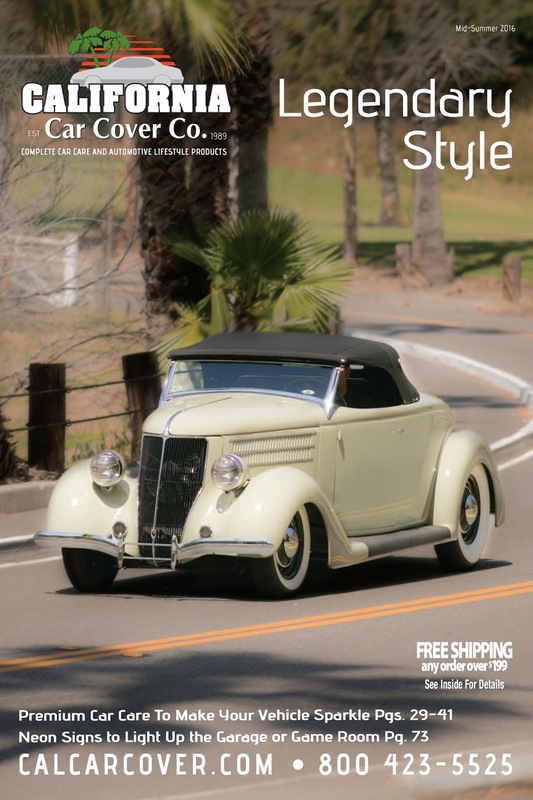 One of the most recent creations from Hollywood Hot Rods graced the front cover of our July California Car Cover catalog cover. Troy Ladd and the crew at HHR put together a beautiful 1936 Ford Roadster dubbed the "Long Beach Legend." The idea and style for this build was inspired by Southern California's hot rod history. We thank Troy Ladd and vehicle owner, Jeff Romig, for providing us information on this unique build. In 1930 Ford Motor Co. opened a plant in Long Beach, Ca to build Model A Fords. Unfortunately, the Great Depression would soon hit and force the plant to close until 1935. When the plant reopened it began production of Fords and Lincoln's luxury K Series automobiles. The rumor is that a small group of employees met to discuss how the Ford roadster's design could be improved by taking styling cues from Lincoln. At the same time, the all new Lincoln Zephyr had been developed and designed in Detroit. Its modern design influenced the group of workers at Ford's Long Beach plant and they began to develop better sketches and more ideas of how to improve the Ford roadster. Unfortunately, Ford Motor Co. removed the roadster from its vehicle lineup in 1937 and the employees' ideas were never realized until now. Whether the stories are true or just a myth, it is all part of the allure of the Long Beach Legend and what could have been. The Long Beach Legend is owned by Jeff Romig. The crew at Hollywood Hot Rods built this custom roadster based off an Eric Black design. The vehicle takes much inspiration from Lincoln automobiles. It features taillights, hub caps, dashboard and steering wheel from late 1930's Zephyr vehicles. Under the hood is a 1940 Lincoln 292 V-12 engine built by H&H flatheads. Hollywood Hot Rods built a custom set of headers and exhaust for the roadster. The 1936 Ford roadster is finished in a Porsche Stone Grey paint with dark olive powdered coated wheels. The exterior features reshaped front fenders that were also moved forward. The running boards were extended and both the front grille and windshield were raked. The vehicle has custom leather interior by Julio's upholstery. Thank you to Troy Ladd and everyone at Hollywood Hot Rods for assisting us with our catalog photo shoot.